Bringing us another eleventh closer to a full Star Trek movie complete soundtrack collection, Intrada have announced they will shortly be releasing the complete soundtrack from Star Trek IV: The Voyage Home. Almost seventy-three minutes of music include the complete score, the punky "I Hate You" track, plus unused cues such as a new arrangement of the original series theme. World premiere release of complete Leonard Rosenman score to all-time classic fourth installment of legendary STAR TREK feature-film franchise, starring William Shatner, Leonard Nimoy, DeForest Kelley, directed by Nimoy. Intrada presentation is part of current ongoing CD restoration series of complete STAR TREK film soundtracks being overseen by Paramount, this one through courtesy of both Paramount, UMG. (Other titles appear on Film Score Monthly, La-La Land labels.) Time travel, whales feature in this particular movie, Rosenman draws inspiration from both in exciting score. Musical ideas are sometimes energetic, exciting, sometimes cerebral, complex. Rosenman even gives thematic attention to Chekov, a franchise rarity! Complete Intrada CD restoration offers full score with previously unreleased cues, versions appearing on 1986 MCA album plus several alternates including Rosenman's unused take on famous Alexander Courage TV theme. Fun to hear Rosenman's own signature brass "pyramid" at climax of Courage's melody! 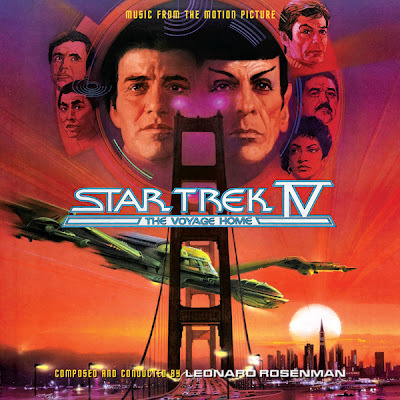 CD even includes wild "I Hate You" by Kirk Thatcher, Mark Mangini that annoys Star Trek crew on San Francsico bus ride. Production by Lukas Kendall, mix & assembly by Mike Matessino plus definitive liner notes by Jeff Bond round out stellar package, itself designed by Joe Sikoryak to comfortably fit in with other STAR TREK feature soundtrack restorations. Leonard Rosenman conducts. You can see the full track listing, listen to samples, and order your copy, on Intrada's website.